Cats are amazing pets. Really, I think they are so easy to own. They require very minimal effort and care and they give so much back to a family. Cats are good for you! But, to have a happy cat and a happy home, you do need a few essential products for cats. This post is sponsored by Single Edition Media on behalf of Ceva Cat. There are the very basic cat essentials, like food and water, but ranking right up there with those, for me, is cat flea medication. I can’t stand fleas and the only effective method of know of to get rid of cat fleas and keep them gone is to use a cat flea medication. If you are right there with me agreeing that cat flea medicine is one of the most essential products for cats, then you will love new Catego. 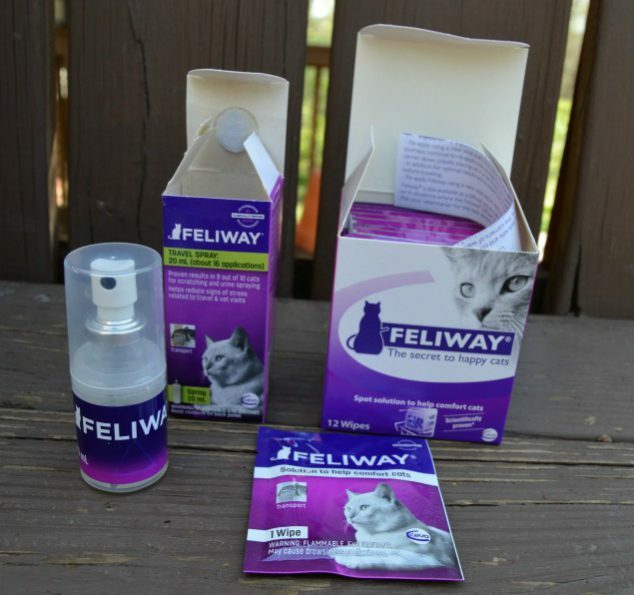 I also suggest Feliway as an essential cat calming product- perfect for coming travel plans or helping a cat adjust to a new situation. As I said, I hate fleas and I’d really like something that kills fleas instantly, or at least as quickly as possible. That is why I am so excited about Catego, a new fast-acting flea treatment medicine. Catego is twice as fast at killing fleas as Frontline Plus and Advantage II! 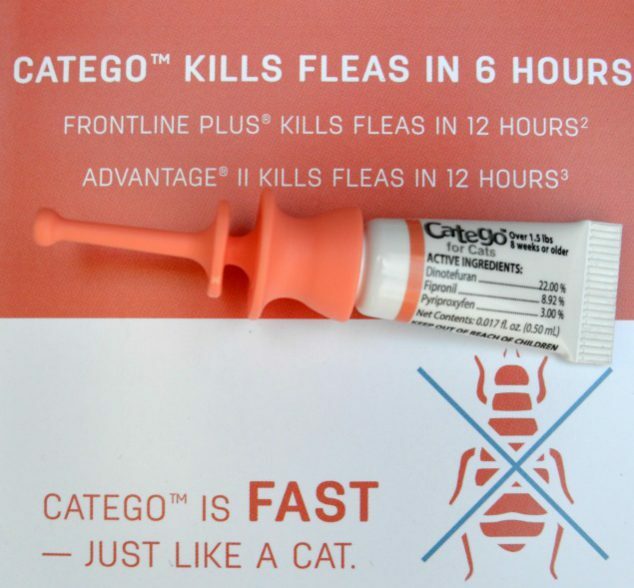 Catego kills fleas within 6 hours, and on the day of application achieves a 97% efficacy within 3 hours. Catego not only kills adult fleas by contact, it breaks the life cycle. I also hate ticks so I am happy to report that Catego wastes no time with those little blood-suckers either. It kills ticks in all stages of life through contact and before they have the chance to bite! Plus, it also kills chewing lice so your cat won’t itch because of unseen lice. 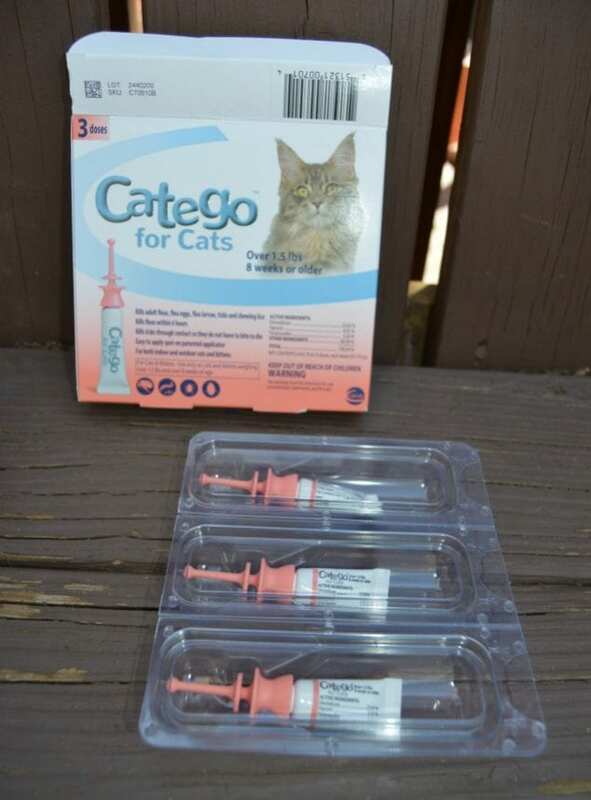 Catego is a topical flea and tick preventive for cats only and it is designed specifically to meet the unique needs of cats. It is simple to use with just one low-volume formulation for all cats weighing over 1.5 lbs and over 8 weeks of age. It is easy to apply with a patented applicator that is easy to open and rounded at the tip for safe application down to the skin level. With just one application, protection lasts for one full month. Do you know how to stop unwanted behavior in your cat? Well, there is a good chance Feliway can help. Feliway® cat calming products use a copy of the natural feline facial pheromone to help cats feel comfortable in their environment. Feliway products create a state of familiarity and security, which helps to comfort and reassure cats as they cope with a challenging situation. A calmer, happier cat is likely to stop unwanted stress related behaviors so you may see the reduction or elimination of behaviors such as hiding, scratching and urine spraying when you use Feliway. Feliway is not a drug or a sedative and has no contraindications to use with any other treatments or conditions. That is super important to me as well. Clinical studies showed that Feliway® helps cats adjust to new surroundings after moving or while traveling and can help eliminate urine spraying and running away when the cat’s environment changes. 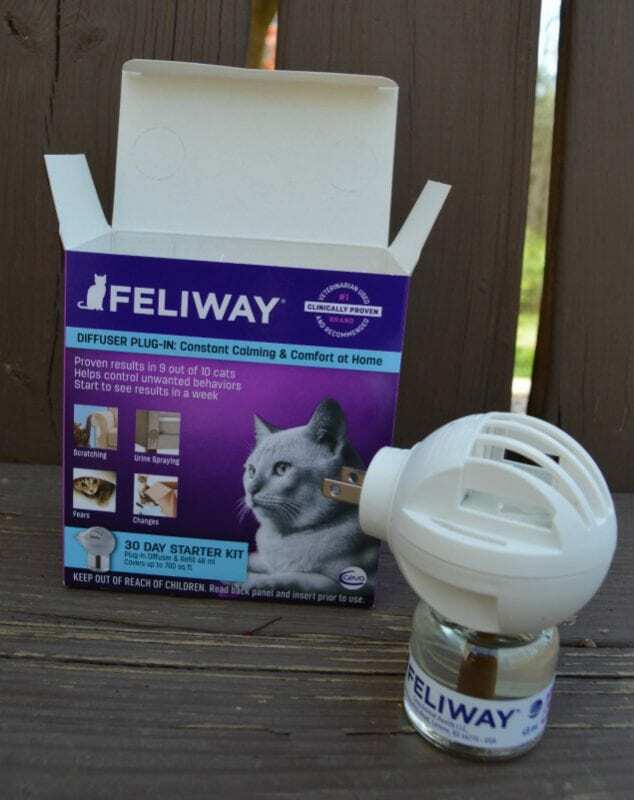 I travel a lot over over the summer so I am happy to be able to have the Feliway Wipes and Feliway Spray as handy tools to help my kitty, Ron, feel better about new places and new things. 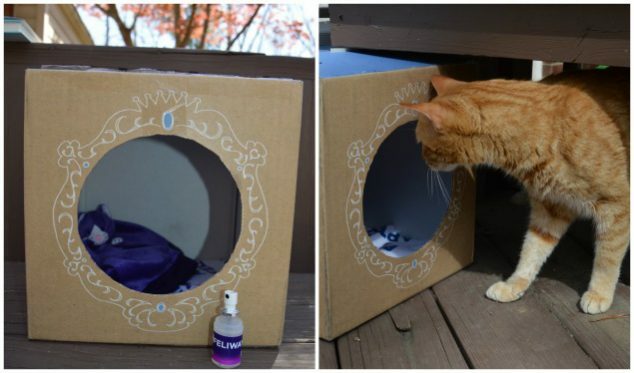 To test it out, I sprayed some Feliway Spray on his new cardboard cat box and snuggly toy. Ron was very interested in checking it out! They also have a Feliway Diffuser that is great for reducing stress at home. You can just plug the Feliway Diffuser into the room where your cat spends the most time, or exhibits unwanted behaviors to make your kitty feel more comfortable, calm, and safe. I hope you’ve enjoyed learning about these essential products for cats that offer better or new solutions so that you don’t encounter any cat problems. 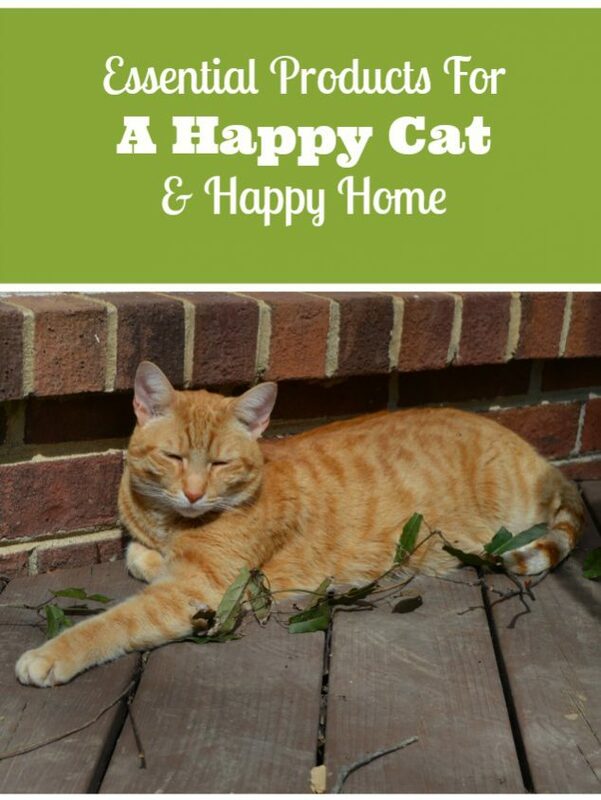 After all, a happy cat, is a happy owner! Which of these essential products for cats sounds the most useful for your cat?